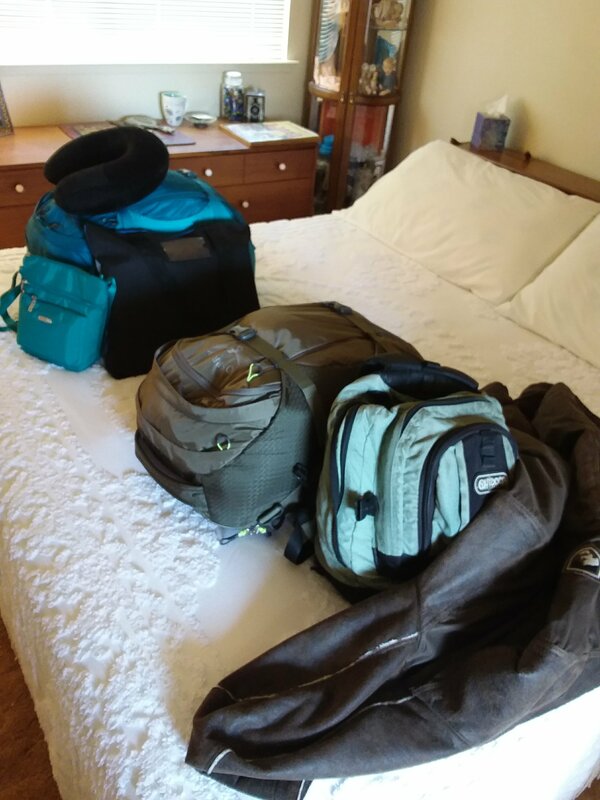 One of the challenges of traveling on a budget is packing such that you don’t have to pay extra for checked luggage. 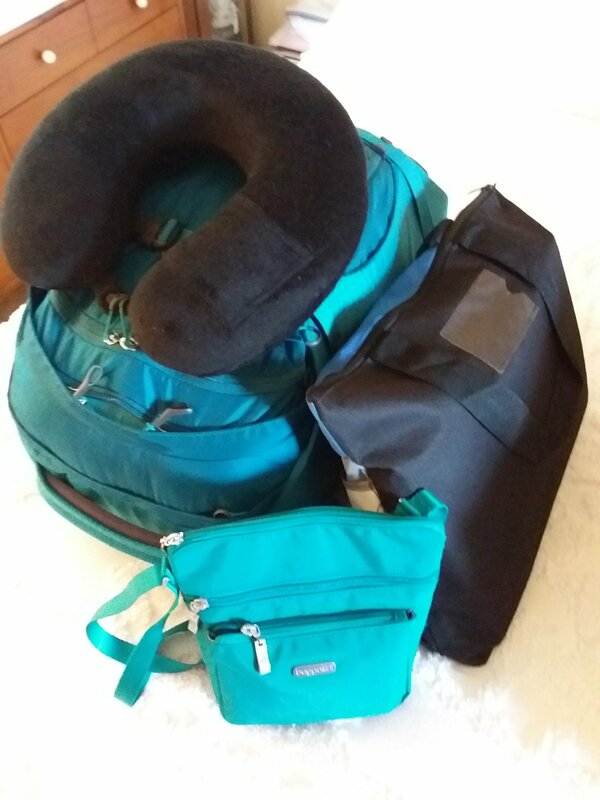 We are used to traveling with two large rolling bags for clothes, a separate duffle for shoes, a sea container for my hair and makeup supplies (or as Kirk references – lube, oil, spackle & bondo) and a couple carry on bags for electronic doodads and whatnot. So, how do you travel three months, from country to country, during season changes, then cruise across the Atlantic stopping at exotic islands along the way, and ride a train from Florida to New York to DC to Chicago to Sacramento in the dead of winter and NOT bring everything? What is the largest dimensions and weight allowed for carry-on on the smallest aircraft we would encounter? What backpack/carry-on would allow us to stay within airline regulatory limits, yet still be able to hold everything we need comfortably (or as my dad would say, “get 100 pounds of ‘stuff’ into a 50 pound sack”)? As backpacking enthusiasts, we turned to REI, knowing they carry quality products that may cost a little more, but they are built to last and they stand behind their products. This purchase would be an investment into long-term travel. After narrowing it down to two different Osprey Travel Pack styles online, we drove to the REI in Santa Barbara to check them out up close and personal. We both chose the Osprey Porter 46 Liter pack. It had features like padded shoulder straps and heavy duty hip belt that are adjustable, yet tuck completely away for convenient overhead storage. It has a full front opening so it packs like a suitcase, not like a top-loading traditional pack, so your items are easily accessible. The bag expands and cinches down depending on your load. Not that it matters, I chose teal and Kirk chose gray (but it looks more like khaki green). NOW…for the fun part! We both took a bin and started placing items in it that we thought we should take. Once we thought we had everything together, we experimented with packing styles: rolling, folding, bagging, and stuffing. We would pack and unpack, swap out or remove items, and pack again. We can still take a personal item, so anything we (or TSA) need quick access to will go in there. For my personal item, I was hoping for a smaller day pack that would clip on to my Porter 46, but I didn’t find exactly what I was looking for. I used a bag we got free from Carnival on one of our previous cruises. It’s not quite big enough, but I am hoping to stop at another REI on the way to the airport. Kirk is using a day pack he has used for years. I also picked up a cross body purse from Baggallini. It has the RFID protection to add another layer of protection while traveling. It prevents those with electronic devices that can read the data stored on your drivers license, credit card and passport. It also has a heavy duty strap and zipper compartments for better protection agaist pick pockets. So, I believe we got it all in. I even packed five pairs of shoes: boots, hiking/walking, workout, black dressy flats and red Toms… plus the navy flats I’m wearing to travel in. Why did I pack so many? Because they fit and a girl has her priorities (and one of the advantages of having small 5.5 feet)! Kirk wears size 13 so,for him, it’s like trying to pack his and hers canoes. He packed tennis shoes and flipflops plus he is wearing the low-top Merrells he wears all the time. So, we are packed and ready! Previous Article Re-pur-pose: Adapt for use in a different purpose. I have the Osprey 46 liter also! I think Chris has the Osprey 65 with a detachable day pack. Since mine doesn’t have a day pack, I usually stuff a string bag in there and then use that on city days. I see that eventually you’re taking a train from New York to DC- we live near DC so let me know and if you have time, we can meet up! I thought I remembered you living in the DC area. At this point, we dont have any specific plans while there, so we will definitely reach out closer to those dates! Since we are headed to areas I know you have been next, I will probably have a million questions for you!